SINGAPORE (Feb 28): Asian currencies were little changed against the dollar on Tuesday, holding below recent highs, as investors awaited U.S. President Donald Trump's speech to Congress for clues on tax reform and infrastructure spending. The Singapore dollar held steady at 1.4036 per U.S. dollar, having retreated from Monday's high of 1.4000, its strongest level since Nov 10. The Thai baht slipped 0.1% to 34.90, and was off Monday's four-month peak of 34.83. Most Asian currencies have risen against the dollar since the start of 2017, as uncertainty about Trump's economic policies dragged down the greenback. 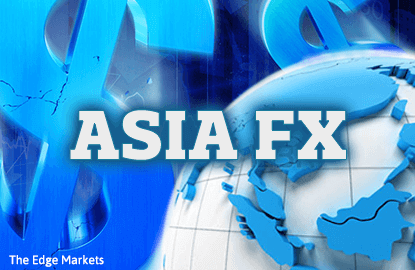 The focus now is on whether Trump's speech to Congress on Tuesday will provide the catalyst for a bounce in the dollar, or open the way for further losses against emerging Asian currencies. Market participants will be watching for details on possible fiscal stimulus steps, such as tax cuts and infrastructure spending, as well as any comments related to trade policy, amid growing concerns about rising protectionism in the United States. If Trump's speech offers "no clarity on the size and the timing" of fiscal policy plans, the dollar's recent weakness versus Asian currencies is likely to persist, said Roy Teo, senior FX strategist for ABN AMRO Bank. Trump said on Monday he would propose a budget that would ramp up spending on defence, but seek savings elsewhere to pay for it. The president is also expected to discuss his plans for infrastructure spending in a speech to Congress on Tuesday. Trump's decisions on trade policy will be crucial to the outlook for emerging Asian currencies, said Jasslyn Yeo, global market strategist for J.P. Morgan Asset Management. "Any indication that Trump will be imposing across-the-board tariffs and/or implementing a border-adjusted tax will be negative for EM Asia FX," Yeo said. "Across the board tariffs and border-adjusted tax, however are not our base case. As of now, we are expecting the Trump administration to selectively target certain industries and products through anti-dumping and countervailing duties," Yeo added. U.S. Treasury Secretary Steven Mnuchin said in an interview with Fox News Channel's "Sunday Morning Futures" programme that he was still "studying very carefully" a House Republican border tax adjustment plan that would levy a 20% tax on imports to encourage more U.S.-based production and exports. "There are certain aspects that the president likes about the concept of a border-adjusted tax, there are certain aspects that he's very concerned about," Mnuchin said.